Vandals have smashed "every single" bird box in a National Trust wood, at the start of the nesting season. 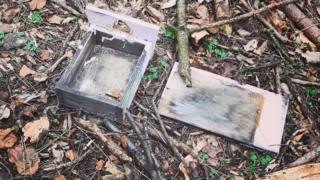 Jacqui Clarke said she discovered about six damaged boxes on a walk in Chute Wood, which is part of the Dunstable Downs in Bedfordshire. The dog walker said she was "horrified, absolutely disgusted, really upset and annoyed" by the damage. The RSPB said the vandalism was "disappointing". The National Trust has yet to comment. Image caption Chute Wood is described by the National Trust as "one of the best kept secrets of Dunstable Downs"
Mrs Clarke, who walks regularly in the popular nature spot with her dogs, said the boxes were up high "where they should be" on Tuesday, but by about 08:30 GMT on Wednesday "every single one was smashed and on the ground". "The rangers look after the area so well, this kind of mindless vandalism is heartbreaking," she said. "I can't understand their mentality, it makes me so angry and flabbergasted." On the Don't Let Dunstable Die group's Facebook page, Amanda Bunnage from the town said it was "mindless and pointless destruction. What possible pleasure can anyone get from this? It breaks my heart". Others commented on the timing and said "this is exactly the time those bird boxes are needed" and "we need to get replacements up as birds will start nesting now". Emily Kench, from the RSPB, said: "This is very disappointing to see especially as we are approaching the nesting season. "Given the threats facing the natural world, more now than ever, we should be working together to give nature a home."